Why do I get so angry so quickly over small things? When your temper becomes a problem at work. Everybody’s different. Maybe you just happen to be a particularly passionate person, and care deeply about things being done the right way. You are probably a very high achiever and in a senior position at work. Maybe you’re the type of person that always delivers a fantastic job no matter what it takes, or sacrifices you have to make – and just can’t understand why everyone else isn’t always on the same page (so anger quickly when they don’t). Maybe you think it’s okay to ‘lose it’ at work, and anger quickly when circumstances don’t go your way; or if it means it gets the job done to the standard it needs to be done, within the timeframe it needs to be done by. What if I told you there is a reason you get angry so quickly that has nothing to do with the particular person or thing you’re directing your anger at? That there’s a better way to recognise and deal with your emotions? In this guest blog a client of mine, Sally, a high achieving senior Executive in a Global Firm, shares her experience in this exact situation. Although she was effective in her job, she was also having frequent angry outbursts in reaction to situations that perhaps didn’t warrant an angry response. After some sessions with me, she realised this was not a useful reaction to events for a number of reasons. She was able to uncover the root cause of her reactions, and has now healed these root causes, so she doesn’t have this type of reaction, ever again. She doesn’t explode at the office anymore, and has generally found more peace, joy and happiness in her professional and personal life. She has even recently accepted an even more senior position in her firm. This is her story on how she did it. I was that person – I was always angry. Little things used to majorly wind me up at work. Not 100% of the time, but it would be normal for me to have an outburst 2-5 times a week, and an angry outburst was my brains ‘go-to’ response when the latest deliverable wasn’t met because someone didn’t do what they were supposed to. When I was coming up through the ranks, I experienced the other end of this anger too – so this trait was considered a culturally acceptable (albeit implicitly) trait of the high performing culture I was in. It was acceptable to ‘lose-it’ every now and then if it meant the job got done faster, quicker, better and in line with client deadlines. That’s what I used to tell myself after I’d had another outburst at one of the juniors at work, or things didn’t go my way. While there needed to be some sort of conversation with them to show them the latest err of their ways and help them become better at their job; getting angry at them wasn’t truly the most constructive or useful tool in the box in every case. It certainly wasn’t healthy for me on a personal level to default to anger every time something didn’t go quite right. Think Louis Litt losing it with the Associates in the Pitt on Suits. 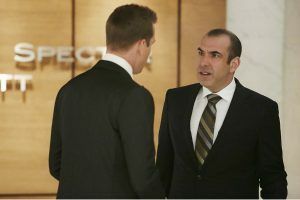 Yup – Louis Litt IS an extreme case. My outbursts were never as full-on as this, so I considered that it was normal to feel a little agitated. I told myself I didn’t have a problem because I wasn’t like that. 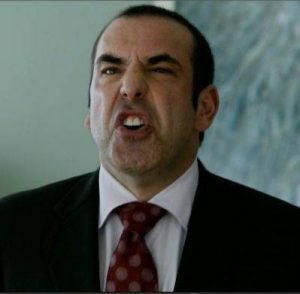 I was nowhere near as bad as Louis Litt, nor did I consider myself having any anxiety issues like he did. Anxiety Blindspot – Recognising a Problem Exists. But just because I wasn’t as bad as Louis Litt, didn’t mean I didn’t have a problem. Little things used to wind me up at work and at home. I was quick to get angry. People just didn’t understand I was busy and didn’t have time to wait for their dalliances or to stop and chat. It was a problem I was blind to, because every time I got angry or wound up, I dismissed it as part of the culture, the way we worked, the high expectations from the client, or having to make sure whoever hadn’t done what I wanted really understood what they had done was not acceptable so as to improve their performance next time. I actually wanted them to feel bad about it. I never thought it was an issue. That was until I got more senior and had less time, and put my own even higher expectations on myself, my role and my team. The frequency of my irritations increased and I realised it was not a healthy response to situations around me, no matter what had happened. Making someone feel bad about something just because I didn’t like it wasn’t really acceptable. Nor was it good for my own personal emotional or mental health. I began to notice some of the senior Partners of the firm did not all behave this way, and it got me thinking and wondering if it really WAS part of the culture, or if this was something that I had to address. I also realised, in my position, I now WAS setting culture, so behaving like this was no longer acceptable. So, recognising I was getting angry quickly was one thing; knowing what to do about it was quite another. I considered myself a generally happy, content person, and wasn’t the sort who needed to see psychologist. However, coincidentally, at the same time, through a business networking event, I met an Anxiety Specialist. I most certainly did not believe I had any type of anxiety. While I didn’t believe I had any type of anxiety, part of the business networking was to refer business to other members, and I needed to understand better what she did for her clients. So I went and had a couple of sessions. It didn’t take long to realise, much to my genuine surprise, that when I was getting angry so quickly, this just a cover for anxiety and self-worth issues. I was completely unaware I had any anxiety in my life; however it turns out there was a relationship between my anger, my anxiety and my self worth. I realised the anger was a cover for feelings that nothing was ever good enough, and could always be better. I used to think this type of perfectionism was a good emotion, and one that made me fantastic at my job. And that is true, when you look at the positive traits of a perfectionist. However I never stopped to consider how my constant need to over-achieve and strive for perfection was directly related to my self-worth, and lack thereof of it. It turns out my Anxiety specialist had seen this problem for women in business a gazillion times over: the over-compensation for lack of self worth through achievement at work. The link to this and why I got angry so quickly, was because, deep down, I felt if I was making personal sacrifices for the ‘greater good’ at work, why wasn’t everybody else? Subconsciously, I was beginning to resent the personal sacrifices I was clearly making in order to gain perfection and over-achieve at work; but didn’t feel confident enough in my own self to take a step back and set more realistic goals and outcomes for myself and my team. More realistic goals that wouldn’t keep me (and my team) at work until all hours, but still achieved the same outcome for our clients. I realised this by addressing the root cause of the problem with my anxiety specialist – my lack of self worth. I thought I was confident, but realised quickly through a series of sessions that subconsciously this projected confidence was really a front for deeper, underlying issues. It was through healing these, that everything got better over time. I wasn’t getting angry so quickly and so frequently. (actually extremely rarely). My relationship with myself and others around me improved. If you are reading this and feel like you get angry quickly, I highly recommend you see an Anxiety Specialist – but not just anyone – Sandy Hounsell has a specialist technique for just this sort of problem that will blow your mind, and stop you blowing hot air at all those around you.